When I was growing up in the 70s and first took an interest in buying records, I remember my parents insisting (as parents do) that when they were teenagers they would go out to music venues and party the night away to the sounds of the local mobile DJ. I never paid much attention at the time, but I always remember the name of the DJ - RON DIGGINS. Now I look back I laugh at how apt his surname now is, but there's more. RON DIGGINS can be credited with being one of the first DJs in the UK to have his own equipment incorporating not one but TWO turntables. This of course allowed him to play music constantly without pauses interrupting the dancing. And not only did DIGGINS build his own twin turntable machine, but he named it the "DIGGOLA". 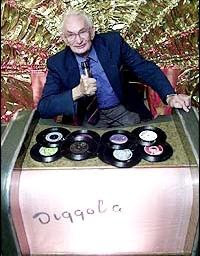 RON DIGGINS (AND HIS DIGGOLA) was what you would call a genuine "celebrity" DJ. My Mum and Dad have both confirmed that wherever DIGGINS and his DIGGOLA were playing across county, the teenagers would follow by whatever means it took. He had all the latest records and he knew exactly what the kids wanted to hear. It seems "diggin'" goes whaay back long before any of us even knew! Before DAILY DIGGERS, and before DIGGIN IN THE CRATES. Of course RON DIGGINS would have been completely unaware of the co-incidental similarity between his name and what we now refer to as Diggin' (record buying). But I'd like to think if he saw the turntable culture that we witnessed explode during the 70s 80s and 90s, he would have a wry smile on his face and be thinking "I've done that!". "In the wilds of Lincolnshire a recent auction of ’40s and ’50s DJing equipment sheds light on the career of a pioneering post-war disc jockey, one of the very first mobile DJs. Monster wooden consoles, ancient bakelite gear and big clunking wind-up double decks, strictly for 78s. The equipment belongs to Boston hero Ron Diggins, who died last December aged 91, having started DJing in 1947 and enjoying a career spanning 50 years. Ron Diggins was a professional radio engineer with a business providing public address systems. "I'd been playing background music and doing voice-overs out the back of my van at school sports days and the like,” he told the Boston Standard. “It was nothing to do with dancing – that was the last thing on my mind." But in September 1947, the farm girls from the Swineshead Land Army decided Ron’s gear could be put to better use: "They were passing the office, saw the van and came in to ask if it could be used for dancing. They were having a harvest supper with some of the Italian POWs. Well, I'd never thought of it before, but I didn't want to lose the booking – so I said I'd give it a go." "Back then there was just the waltz, the quick-step and the Palais glide – and I always ended up with the National Anthem," he explained. "It was unheard of at the time to play records at a dance and it just took off from there – although I had no idea how things would snowball." Ron’s 78s proved wildly popular, no doubt because his record selections gave audiences slightly grander music than they were used to. "When I started out, the ordinary village halls danced to live piano and drums – that's all. If it was something extra special, they'd have a violin as well." In 1949 he built his famous ‘Diggola’ a wonderful art deco mobile DJ booth modelled on the bandstands of the jazz era. The first of six, it came complete with double decks for 78s, a home-made mixer, lights, microphone, amplifier and ten speakers. "It took me about six weeks to build the first Diggola. We couldn't get plywood in those days, so soon after the war. So I had to make it out of coffin boards." Diggins was not alone in his pioneering efforts. In his Radio 4 documentary ‘The Other Mobiles’ Chris Eldon Lee tracked down a series of DJs operating in the 1940s and ’50s, including Bertrand Thorpe, who as far back as 1941 was rocking the crowds with his 30-watt amplifier. Bert recalls how he’d stand with his back to the audience flicking three 40-watt light bulbs on and off in time to the music. In the ’50s Ron Diggins’ fame had spread so widely around south Lincolnshire that he had to hire two other DJs to keep up with his bookings. His success angered the Musicians’ Union, who used their clout to prevent him playing larger venues. So sadly, though he’d set his heart on it, Ron never played Boston’s Gliderdrome. He retired in 1995 after playing around 20,000 parties. The most he ever charged was £50." "I've invented nothing," RON DIGGINS insisted on his 90th birthday. "I put the same things to a different use, that's all..."
We are just reminiscing and remember Ron Diggins well. He used to play on his Diggola at our local village hall in Claypole Lincs. He was great!! Non stop music and dancing, non of the silly chit chat that modern DJ's seem to think we want! I was working on the ward at Boston hospital and helped to look after him in his final days which was a privilege. Good old Ron! RIP Long may he be remembered fondly. i remember Ron and the Diggola well from the early 70s when he was a regular at Billinghay. Ron played weekly on Thursdays at the Temperance Hall in Coningsby in the early 1960s. The place was usually packed with airforce men n and locals with 'talent' (as young ladies were then known) bussed in from Boston and places en route to Coningsby. My sister, now living in the US, was a devotee of Ron's regular Saturday night stints at the neighbouring village of Billinghay as early as 1957. As to the music, recall Ron playing a lot of US country and Western though not much doo wop or early soul. Otherwise it was hot off the presses 'top of the pops' but also originals where an English group or singer had done cover versions (eg Isley Brothers Twist and Shout). At Coningsby he always finished with a smoochy slow number. I'd be interested in hearing what kind of music other Digginites recall Ron playing.